http://www.textsfromlastnight.com/ - My newest discovery. Labeled based on area codes. 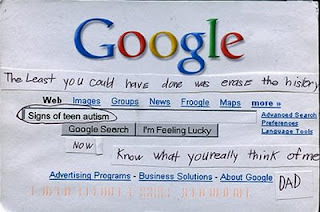 http://postsecret.blogspot.com/ - Every Sunday, like clockwork. I heart Frank. Sometimes the comments posted make them twice as meaningful. I see signs of a father who cares. http://www.overheardinnewyork.com/ - My favorites are Wednesday One-Liners and anything overheard from transit workers or bums. A great title adds so much. Four-year-old-boy: And there was a girl. And she had rainbow hair, and rainbow clothes, and a tattoo that was a rainbow, and rainbow socks. Four-year-old-boy: She picked her nose! Post a comment with your favorite fun sites, or something especially awesome you found from one of these websites. You go Donna! You are post-happy tonight! Yeah... I'm getting a lot of proofreading soon, plus the impending chapter 10... so I figured I'd write about all the ideas bouncing in my head before I disappeared for a couple weeks.